“These are not the droids you are looking for…” I must have uttered that famous Jedi mind trick phrase by kenobi a million times while playing with Kenner’s Land Speeder. And pound-for-pound this may have been the best of the Kenner toy vehicles given how faithful it was to the film version. The crazy depressable shock system on this toy gave the illusion of the actual gliding of the land speeder, and I was extremely impressed with the hood opening to reveal the mechanical innards—I never tired of this one. And when you coupled it with the Creature Cantina, it was without question one of my favorites, if not my favorite, of the Star Wars vehicles. This entry was posted in 1102xmaS and tagged 1102xmaS, kenner, Land Speeder, star wars, toys. Bookmark the permalink. This is one of the few Star Wars toys that I’ve been able to pass on to my son (and he still plays with it). I gotta say the spring suspension was an elegant way to create the illusion of floating. The other lucky winner is the Hoth World Ion Cannon, which still impresses me, and apparently Wills, too, who is particularly fond of it when we have snow. I had the storm trooper transport (to go with my single storm trooper). It had cool sound effects. This (and a Star Trek phaser that had lenses to project images on the wall) were the only two toys that I actually USED the sound effects while playing. Usually, it was better to make my own. We’ve been looking for my deathstar (which my landspeader had tremendous success blowing up, due to my not having an xwing) it’s gotta be around here somewhere. 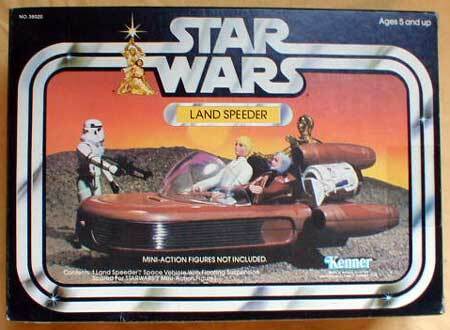 Still have the Landspeeder too – son inherited this summer. Nice touch – Speeder + Cantina combo – one of the best scenes/environ in the StarWars saga. I loved this toy, but I was never happy with the way R2D2 sort of just laid there on the back of the speeder. I do recall running this thing on the linoleum in the kitchen and marveling at the way it did actually glide. I am so jealous of all the people saying they’ve passed these toys onto their children … I am on a quest to locate mine. Until then, it is Christmas morning and I know for a fact my little man is getting a nice modern Star Wards haul! Gotta go … and Merry Christmas to everyone!